Bhandari also offers his take on the US-China trade war and how it presents a win-win situation, and speaks about speculating in commodities. 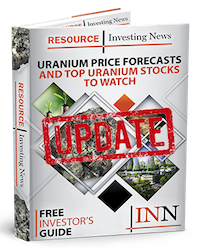 Speaking with the Investing News Network at this year’s Vancouver Resource Investment Conference, financial analyst Jayant Bhandari made a case for avoiding uranium projects, saying that low demand and the rise of renewable energy mean the commodity’s future is grim. In a wide-ranging interview, he also offered his take on US-China trade war and how it presents a win-win for global markets, and shared his opinion on investors speculating in the commodities market. Spoiler: he says don’t do it — but back to uranium. “Most uranium-mining projects do not make sense unless uranium prices go up by 100 or 200 percent,” said Bhandari. Clearly not a fan of the energy resource, he explained that uranium-based energy production is falling, while alternative energy supplies are becoming cheaper — like wind and solar. The end result, said Bhandari, is that there is no case to invest in the commodity, pointing out that uranium lacks any green credentials as well. “[‘Green credentials’ are] camouflage for a lot of investors’ greed,” said Bhandari. Leave it to the markets, he said. Securities Disclosure: I, Scott Tibballs hold no direct investment interest in any company mentioned in this article. What is important is to never forget that we all are living on the same Planet.We all need to take hands and pray for a brighter future for us, our families during this uncertain time.